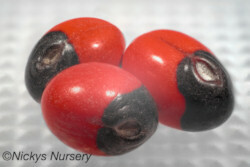 My aim is to supply seed of the finest and most reliable the market has to offer at realistic prices, used by gardeners and commercial growers, sourced from World leading seed producers and giving you the best value for money and service possible. Nickys Nursery has been online since 1999. FERA* Registered seed packer, our packers number 7049. All seed sold subject to availability. All prices include VAT where applicable. Seed is packaged in hermetically sealed foil packets for all seed packets excluding some Tree seeds. 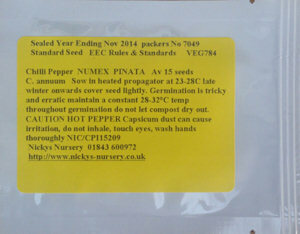 Depending on the seed to be packaged we use either Scales, Hand Count or seed counters. Vegetable packet labels are colour coded and contain all information required by FERA (Food and Environment Research Agency). 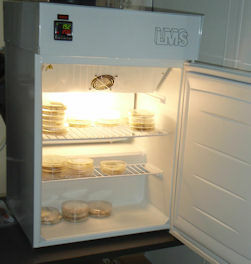 Storing seed without losing seedling emergence potential needs carefully controlled humidity and temperature conditions. Seed will not keep for long periods of time and remain in good condition. If you have to store seed, place unopened packets in cold conditions, any opened packets should be stored in sealed containers in cold conditions.